The day was overcast and overly cold, when the phone rang. “Auntiji, can you do me a favour?” Hmmm, now who was this fine young voice I didn’t recognize, and how could Auntiji possibly say “no” to this? “Of course,” I said. “That’s wonderful,” said the voice. “What do we wear?” I asked. The day came, and our worthy leader organized us at the meeting place. We were dressed in elegant white Punjabi suits, strap-on kirpans, and navy chunis. The sangat formed, with both familiar and new families. We were missing one member of the Panj! She arrived late because of all the neighbouring street closings. They are part of the new transportation system which is called the “which-way-to-turn-to-get-wherever” on one-way streets. Still, we had plenty of time before moving to the flag square. Hundreds of Sikhs in their finest attire gathered, greeted each other, and joined in singing the kirtan which was delightfully presented by our talented local children and their teacher, Ragini Devinder Bhanji. The Sadh Sangat smiled with pride. 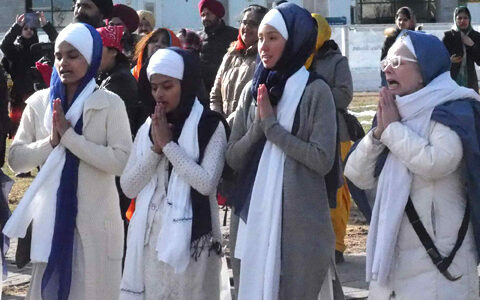 We women of the Panj Piaray stood with the greatest respect, on frozen ground, in our bare feet. Most were without coats. The wind was bitter. When the Anand Sahib kirtan for the flag-raising began, we looked up the magnificent pole. It was at least three stories high! The first sevadar secured the handle and turned the crank twice. It resisted, and she moved back into our group. The second and third sevadars did the same. The fourth one offered four to six turns of the handle and stepped back to the group. Anand Sahib was almost finished. The Sadh Sangat looked dejected as the Nishan Sahib was only one-third of the way to its place in the sky. I, being the fifth sevadar, called on my father Guru Gobind Singhji to back me up on this. Everyone was looking at me. I was the little, elder white woman and would never be able to get the Nishan Sahib to the top in time. I stepped to the encompassing pole, grasped the handle, and kept my mind focused on the Guru. I checked the flag’s progress, inhaled and kept up the circular force while the orange and blue sign of Sikh identity danced in the forceful, multi-directional wind. Success was achieved! Our identity was flying high! Joy and relief were found in the faces and voices of all present before Anand Sahib was completed! Ardas was performed for a thanksgiving for life in Ottawa, Canada’s capital. Voices sang “Oh, Canada,” our country’s national anthem in unison. An Ottawa Sikh Society member then introduced the Councillor who delivered a short speech, commenting on the cold as a reason to keep it short. The president of the Ottawa Sikh Society accepted a framed proclamation to the Sikh Community. 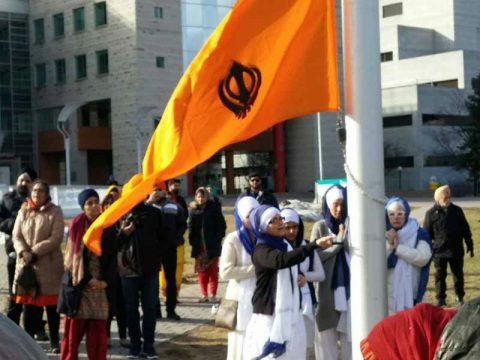 Ottawa’s first all-woman Panj Piaray and a devoted Sadh Sangat served Ottawa’s community with devotion through our simple offering of Sikh identity in our icy homeland. Afterward, we quickly retreated from the ice-covered ground to our shoes and the inside. We laughed at our stalwart success and partook of delicacies served in the name of the Guru. All in all, a blessed day! 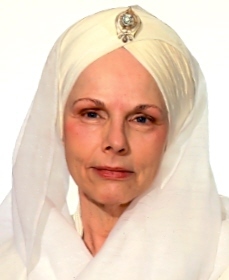 SS Siri Bandhu Kaur is an ordained Sikh Dharma Minister from Ottowa, Ontario Canada. 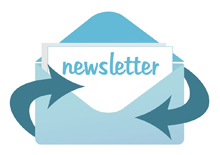 She joyously serves in the teaching, healing, and business fields. She and her husband SS Harimander Singh have married over 1,450 couples in their business “Weddings Your Way, A Perfect Wedding.” She lives in Gratitude to the Divine for a most blessed life.